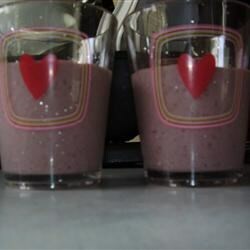 "This is a delicious smoothie that reminds me of the chocolate covered blueberries we bought every Christmas. Light and sweet, perfect for a summer night snack! I use fat free cocoa mix to make it lighter, or my favorite flavored cocoa mix, like chocolate hazelnut, to change it up a bit." Pour the milk, blueberries, hot cocoa mix, and chocolate syrup into the container of a blender. Blend to desired consistency, and pour into a tall glass. Delicious and quick. we made it with strawberries instead of blueberries though... i recommend! This was SO good! I added a scoop of lowfat vanilla frozen yogurt as well. A new favorite! Great delicious smoothie. Little chunks of blueberries make it SWEET! I put a little more chocolate syrup. Great activity for children like me! I used fresh blueberries and I didn't add chocolate syrup but I don't think it was needed. This is a super simple and pretty good smoothie.